This article is part of special IPS coverage of World Press Freedom Day. NAIROBI, Apr 25 2017 (IPS) - As the clock ticks down to Kenya’s general elections slated for Aug. 8, a move by the Kenya Communication Authority (CAK) to make journalists adhere to guidelines on election coverage has elicited fear that the government could be trying to control how they report on the polls. The rules, announced on Feb. 28, require Kenyan journalists to keep all notes and recordings for six months and ensure that radio and TV guests do not make hateful statements about individuals and ethnic groups. 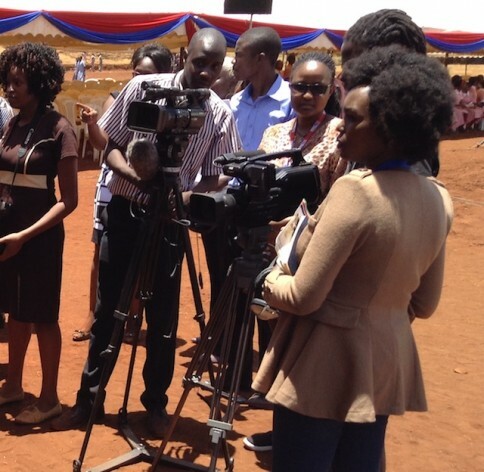 On March 7, the media managers also signed up to another poll coverage code designed by the Media Council of Kenya (MCK) in collaboration with Independent Electoral and Boundaries Commission (IEBC). The council is a quasi-governmental body charged with protecting media independence and enforcing standards of professionalism. MCK rules also require media organisations to remain truthful to the tenets of responsible journalism that is sensitive to peace and objectivity during the polls. Kenya was engulfed in post-election violence in late December 2007 and January 2008 due to a poll dispute that saw some 2,000 people lose their lives and over 3,000 flee their homes. The media was blamed for not doing enough to forestall the violence, which took an ethnic angle. The scenario was to influence the subsequent election in 2013, which was peaceful but saw the media depicted as being overly timid. Critics noted that most coverage failed to raise the tough issues facing the country during the election period. Not everyone thinks the guidelines are a bad thing. According to Dennis Odunga, a reporter at the Daily Nation, Kenya’s leading daily newspaper, enforcement of the rules will be a challenge as long as impunity continues to prevail. But the CAK guidelines are just a reminder that the media is expected to promote fair coverage in line with journalistic standards. “For instance, keeping notes and recordings is not a new thing in the media world. It is a rule we apply when dealing with sensitive matters like in investigative stories,” he observed. He said that it is possible to check hate speech in both print and electronic media. In the case of radio and television programmes, hosts should be in control of their guests and be fast in interrupting those who use the platform to whip up ethnic emotions – although such a measure should be done with decorum. Fair coverage of the election might remain a mere wish anyway, given that media houses are known to be driven by both ownership and editorial interests, he said. CAK’s Angela Koki, speaking on behalf of Director General Francis Wangusi, told IPS that the Kenya Information and Communication Act 1998 gives the Authority power to prescribe a code that sets standards for the time and manner of programmes to be broadcast. She said the Authority prepared the Programme Code and Complaints Handling procedure for use in the regulation of broadcasting services with stakeholders. “The consultation was done in line with the constitution and consolidation of inputs, the final documents were published and came into effect on 1st July 2016,” she said. In exercising its mandate, Koki said the CAK is simply reminding media houses about already existing regulatory provisions governing the responsible use of broadcasting platforms before, during and after the elections. “Coverage of elections and political parties can be found under section nine of the Programming Code and requires that broadcasters provide equitable coverage and opportunities to political parties participating and candidates among other standards,” she said. On whether media practitioners are being burdened by multiplicity of regulations, Koki said CAK’s mandate is to regulate broadcasting houses as its licensees, and does not extend to journalists or journalistic practices. She added that the Media Council of Kenya (MCK) is the regulator mandated to handle professionalism and accountability of media workers and journalists. “The requirement to keep broadcast recording for a period of one year and also the requirement of delay of live broadcasts by seven seconds so as to manage unintended content before it goes on air applies to broadcasting houses as an entity and not to journalists,” she clarified. She concurred with Odunga that the Programming Code is a living document and is to be reviewed every two years. She thus urges journalists to give their inputs towards the improvement of the document whenever there is a call for stakeholder consultations. Her views were echoed by MCK Deputy Chief Executive Officer Victor Bwire who said there are no new guidelines announced by the communication Authority of Kenya. He reiterated that the authority just talked about the need for implementation of its programmes code for radio and television that was instituted in 2016 noting too that CAK’s programmes Code was arrived at in a participatory manner. Bwire said views were sought from CEOs of media houses and representatives of the Editors Guild. “They are really not new, we just update to include issues relating to gender sensitivity and emerging matters like fake news,” he said. “The aim is to ensure fair and professional coverage of elections. The measure is also aimed at adherence to standards, just as is the case in when it comes to climate change and business reporting. There is nothing new, if anything each media house has its in house policy,” he added. Kennedy Epalat, a radio news editor at the Kenya Broadcasting Corporation, said CAK’s move is influenced by the perception that media helped foment the post-election violence of 2007/8, especially local radio stations. “By retaining the recorded material and the scripts for six months, relevant agencies get evidence to sustain prosecutions in order to avoid the propagation of hate in future,” he observed. In relation to radio and television guests, Epalat said it is incumbent upon programme producers to blacklist those with notoriety in propagating hate. Guests should also be prepared by the programe hosts on the dos and don’ts, although such measures are not devoid of challenges. “In 2004, I black-listed a member of parliament (MP) from participating in my radio programmes because of attacking the president whenever he was talking about crime or corruption. This is even after asking him to avoid the same. I even told my presenter as much. Two months later, the MP was appointed as an Assistant Minister for Information and Broadcasting and asked my station to set aside one hour weekly for him which he would use to outline government policy. Fortunately, I was not victimised,” he recalled. Commenting on how the multiplicity of guidelines will impact on the 2017 general election coverage, Epalat said that accessing information and freedom of expression will be impeded under certain circumstances. “The people you seek information from may not offer that information as freely as they would do if you came from their community. People will tend to trust one of their own with information – especially if it is sensitive,” he said. He said the challenge will be aggravated if those covering the elections have not undergone training in light of the emerging rules. And like Odunga, he is concerned with the problem of impunity. “Considering that most media houses are privately owned by influential politicians and well connected individuals, it remains to be seen whether those who flout the rules will face justice,” he observed. To fellow journalists, he said since MCK has signed a memorandum of understanding with the IEBC on elections coverage, as long as they abide by its guidelines, and apply the rule of common sense; cognizant of the past chaotic elections, then they do not need to worry.